2 Martin Logan Vignette speakers. A versatile wall-mount speaker that fits any application, Vignette provides electrostatic-like sound at a fraction of the price. Flexible, versatile, high-resolution sound Engineered throughout to our highest standard, Vignette delivers impact and performance unprecedented for a speaker of such light weight and compact dimensions. 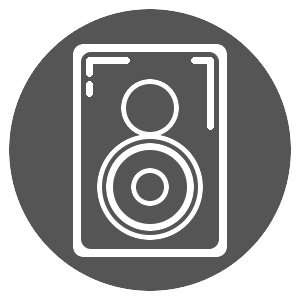 Advanced Thin Film drivers, long-excursion low-mass woofers, and sophisticated crossover combine to produce sound with a lifelike clarity and openness approaching that of our electrostatic designs. Vignette is also very adaptable, working equally well whether mounted horizontally or vertically with the included wall bracket.